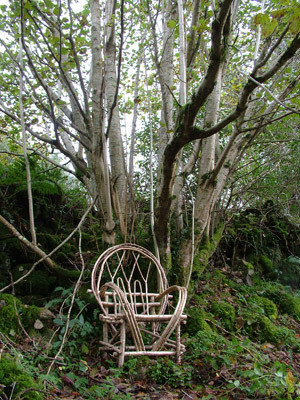 This chair is made in the style of ‘rustic furniture’ where un-sawn branches from trees or hedgerows are used to fashion simple furniture. Making this type of furniture is really enjoyable for the organic, natural look it achieves but also for a deeper meaning or connection it allows and that has lessons for understanding sustainability. Building with natural materials requires adaptive learning, letting the materials influence and guide the precise outcome, starting the work without knowing the final result but trusting the process. For me, this style is really about working with resources as they are and as such requires a different mindset than standard furniture making. This style only works well if one allows the branches to determine the exact shape, look and feel of the piece. The finished piece is a function of nature’s design and the maker has to be able to read or interpret that from the natural forms present in the branches. Like many folk crafts such work can be learnt in a day but it takes a lifetime to master. Using sawn timber (lumber) to make furniture is more of a control type mindset, though of course, one still has to know and understand the material really well to be able to master that craft too. To make rustic furniture, you have a very different ‘cutting list’ for the timber required. It is a case of laying out the branches on the workshop floor and seeing how they might fit together in a form that is both functional and stylish. Then setting about the assembly and being open to surprises, to re-interpretations as the piece unfolds. In moving towards sustainability we need to concentrate on letting the outcome evolve, to focus on ‘learning from the future’ if new and appropriate solutions are to be developed. The work of Otto Scharmer, Peter Senge, Meg Wheately and many others speak of changing our approaches to problem solving, of working with what we have, of allowing the solutions to co-evolve with the involvement of all stakeholders. I find that making rustic furniture helps me to practice much of these ideas in a manner that is both enjoyable, self-educational and also furnishes my house. Now, that’s a result. Sustainability, a symbiosis of all. What this means for organisations moving towards sustainability. There are several points here that have a bearing on organisational change and sustainability. Often the first dilemma we face in moving towards sustainability is how to stop being ‘unsustainable’ – our current mode of operations. This can require creativity and imagination as well as a daring to do different things or at least to do things ‘differently’. Many people feel that they are not creative simply because they do not work in theatre or the arts. However, there are many ways to be creative and unearthing and recognising this within the group is important if we are to create the platform for future innovative change. We approach problem solving and make decisions on the basis of our life experiences and our creative selves can be a very useful skill to engage with. Appreciating the diversity of talent amongst those present builds respect for the skills sets individuals bring to the process. Recognising the diversity as a strength of the group and not a threat means we can actively seek diversity and not try to gather similar thinkers together as is often the pattern used. If the space for this sharing is properly nurtured then we can begin to see the commonality within that diversity, to recognise the shared experiences and to harness the strength of the team and its full range of skills. The identifying of agreed outcomes in advance can work well in a proscribed problem with a correct solution and organisations have done this very well for many years. However, working towards a future that has many correct solutions or that is uncertain, requires a different mindset, allowing the future to unfold through the exploration process. Allowing time to establish the principles that govern the outcome can give confidence to guide the quest without getting bogged down in detail at the outset. Such principles should help us to work with the current situation, to better use the resources that we have at our disposal and to allow an appropriate solution to emerge. Working is this manner and building this ‘open space’ for change is what SustainEd does. With qualified facilitators, we can support organisations that want to develop innovative change programmes that are built on the current situation and available resources, leading towards a more sustainable future. It is up to us all to start to use the talents we have at our disposal, to create the working environment that will allow us to tap into the skills of all personnel. This can be fun, it can be fulfilling and really motivating to work towards a better future for all. Creating the space for that change is what we do.